You most accurately reveal your view of the Lord during your times of difficulty. Life pressures expose your strengths and weaknesses. While you do not want to ask for trouble, you most definitely do not want to miss the opportunity to assess your faith when pain comes. The number one relationship in your life is God, so what you think about Him is the most important thing that should take up your brain space. There are no thoughts higher than our transcendent, infinite, all-powerful God. He is your most effective help when trouble comes into your life (Psalm 46:1), but if your thoughts about Him are insufficient, the assistance you receive from Him will be inadequate. This truth makes assessing your “God thoughts” one of the most important things you can do. The good news is you can determine your thoughts about God at any time. All you need is one key ingredient. That’s personal suffering. Too often the first response to trouble is how to get out of it. That is a mistake. God is in your problem, whatever your issue may be. Your first response should be to discern the mind of God. Just maybe your trouble is the passageway to a more profound experience with God and a better life with others. The Lord taught me this lesson many years ago after someone murdered my first brother in 1987. After receiving the news of his death, I asked the Lord what He was doing and how did He want me to respond to what was happening. His death did not make sense to me. That tragedy went beyond my scope of understanding. I needed someone who knew more and could do more, to help walk me through that horrible unchangeable situation. Seeking God did not change my trouble. It did not take away what I had to endure. But it did make all the difference in how I processed the pain. Either I was going to be problem-centered or God-centered during that difficult time. The God-centered person shows trust, faith, courage, grace, hope, peace, strength, and clarity when trouble comes. The problem-centered person shows fear, worry, anger, despair, vulnerability, and confusion when trouble comes. It is not that the God-centered person avoids the temptation to worry about or control the situation. Not at all. He may fear episodically or seek to control at times, but he is mostly managed by faith in God rather than by the tragic circumstances. Think about your last difficult season. Were you mostly God-centered or problem-centered? Perhaps you are currently in a difficult season. Where do you land on the “God-centered to problem-centered” spectrum? This problem is what makes Job’s response to trouble so amazing (Job 1:20-22). His first response to his disappointment was to worship the Lord. It was only after his counselors came to counsel him that things went from bad to worse. I am not saying his counselors made things worse, though it appears they did. I would say the Lord used their awful counsel to dig a little deeper into Job’s theology. And that was a good thing because Job’s thoughts about God needed to improve. To some degree, Job believed in the retributive principle: If you do good, the Lord will reward you, and if you do bad, the Lord will bring bad into your life. You see the first instance of this in Job 1:5. You also see it interspersed throughout his dialogue with his three friends (Job 3:25). Job had great thoughts about God, but they were not pure thoughts. He tried hard to avoid adverse outcomes (Job 1:5). He loved the Lord, and he had an unhealthy view of the Lord. Job lived with a low-level fear of the negative (Job 3:25) rather than high-level trust in the Lord. His suffering brought his underdeveloped theology to the surface. Though his friends were a pain in his side, they were also a means of grace, used by the Lord to lay out his entire under-developed theological substructure. Maybe you have heard someone say, “I tried Christianity, and it did not work for me.” Typically, this kind of statement reveals the retributive principle of doing good, receiving good or doing bad, receiving bad. Life had not gone the way the person hoped, so they tried religion. It is the idea of the plane going down, and everybody becomes religious. In such cases, the Lord becomes the rescuer. The person attempts to manipulate the Lord to get what he wants. He tries Christianity to achieve a good outcome. This kind of cynicism always ends with disappointment. The Lord is not your insurance agent–at least not that way. You were not made to have all of your dreams fulfilled. You were made to glorify God. Your Creator is the one who determines how you are to live. It is a sin that distorts your thoughts about God and life. If I do well, the Lord will shine His face on me, or if I choose to sin, the Lord will get me. It is true there is a law of sowing and reaping (Galatians 6:7). If you put a small metal object in a power outlet, you will be shocked. Your instructor will punish you if you get caught cheating on a test. If you choose to eat anything you want, while not exercising your body, the chances of having unresolvable health problems are assured. Sowing and reaping are laws that work some of the time, but not all of the time. How many times have you done something dumb and nothing terrible happened to you? When I think about the stupidity of my life, I am amazed at God’s grace (Ephesians 2:8-9). I have not, in every way, received everything I deserved. What went around for me did not always come back around to me, and I praise God for this. Your theology of suffering and sin must come under better theological scrutiny. There are three ways to view the hardship that comes into your life. As I lay them out, which one most accurately describes you? Retributive – If you do good, things will be okay, but if you do bad, bad things will happen to you (Job 1:5). Presumptuous – You can sin, and get away with it because the Lord is gracious and you do not live under the law (Psalm 19:13). 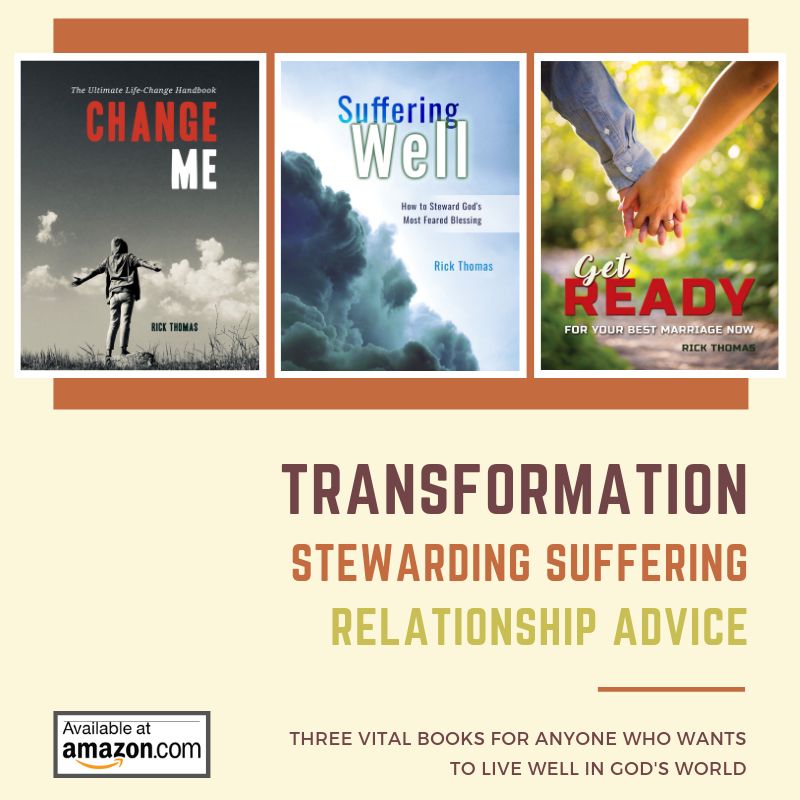 Trusting – You have been called to suffer and sometimes the Lord will use personal suffering to bring about good things in your life (Romans 8:28; 1 Peter 2:21-25). If life worked according to the “do bad, get bad” formula, all you have to do is figure out what you have done wrong and start doing good. This idea is a major tenet of the health and wealth gospel. This kind of theology places power and justice in your hands. It is karma Christianity. It is legalism: Your works are what matter most. It is putting you in the center of the universe while God becomes your divine Santa. You cannot reduce the Lord God Almighty to a formula. You do not serve a manipulatable Lord. Meeting all of your desires and giving you everything you want is not at the top of His to-do list. To get all of your desires met by the Lord is as unwise as it is unbiblical. No loving parent would parent that way. Getting everything you want is how you become Satan, not Christ (Luke 22:42). The Lord is mysterious (Deuteronomy 29:29). He is not like you (Isaiah 55:8-9), therefore it is imperative you understand Him according to who He is, especially during your darkest trials. Here are three critical considerations to factor into your theology of suffering. You must factor what the Lord thinks about you and your trouble into your seasons of heartbreak. His answers will always be somewhat different from what others will tell you. This reality is why you must guard against pat answers when life is going sideways. You do not serve a formulaic Lord. There can be times of joy and times of sadness while you should not tie either one of those seasons to your behavior. Sometimes it would be better for you to spend more time with God than with a counselor. If you go to a counselor, you will receive answers. If you go to the Lord, you may not receive solutions. Job would have been better off if he had not sought the counsel of friends, choosing instead, to ask the Lord. Everything does not have to have an immediate answer. When God does not act like you think He should, it just means He is working in ways you do not yet understand. Your faith is supposed to be in the Lord, not in being omniscient–knowing all the answers. The former will strengthen you in the Lord while the latter will weaken you through self-reliant contrivances. This perspective means your starting point about God most have goodness built into it. If you do not believe the Lord is good and is seeking your well-being, you will try to take control of your situation by turning your life circumstance into your version of good. This reaction will end with personal disappointment and relational dysfunction. Humans are tempted to give pat answers to unravel the mysteries of life. Sometimes these attempts to figure things out sound hollow when compared to the greatness of God. People still die of debilitating diseases, through no fault of their own, and good things happen to bad people. You live in a world that is out of your control, though it is not out of the Lord’s authority. Because of the turned upside down world in which you live, three things will always happen until Jesus comes to straighten out what is crooked. The Lord will allow bad things to happen to all people. The Lord is in control of all things. The Lord is always working for the good of those who trust Him. How you think about these truths will cause one of two outcomes. Either your circumstances will rule your life as you continuously fight to seize control of what you cannot control or you will struggle to find rest in the Lord while living in a fallen world (Hebrews 4:11). What master are you going to serve (Matthew 6:21, 24)? Are you more controlled by your circumstances or by the Lord? If you are seeking to rewrite the script of your life by seizing control of your life, you have made yourself a god, which places you in more significant conflict with the Lord than with your problems (James 4:6). If you believe God is good and He is working good in your life, you will be able to find rest in your storms (Matthew 8:24). Who are you going to serve? What you think about God is the most important thing you can think. The most effective way to discern your thoughts of God is how you respond to your suffering. If you are genuinely interested in exploring this further, I appeal to you to make this piece a topic of conversation among your friends. Job had three friends, but they were not the best kind of friends to walk him through his troubles. Still yet, God was in control of the situation, and He used Job’s friends to unpack a weakness in his theology further. Will you trust the Lord by bringing your thoughts about God, as understood through your suffering, to your community?